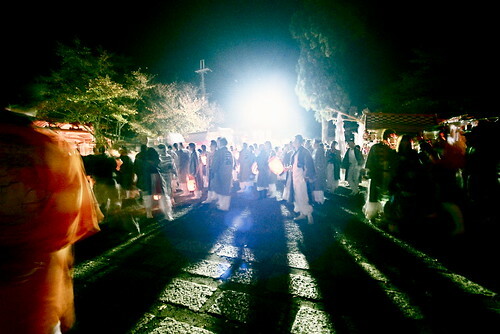 This last autumn — way back on October 17th — I trucked over to Sasayama to attend the annual Sasayama Autumn Festival (篠山秋祭 — sasayama aki matsuri), which is officially called the Kasuga-jinja Religious Festival (春日神社の祭礼 — kasuga-jinja no sairei) and presumably has its origins as a harvest festival. The matsuri coincides closely with the annual kuromame (black soybean) harvest and I was able to bring a nice bag of the black beans back home to Osaka. If your bean needs happen to be much greater than mine, there are delivery services available near most of the stands that pop up along the edges of the bean fields at this time of year and you can send home enough boxes of beans to make your heart content forever. 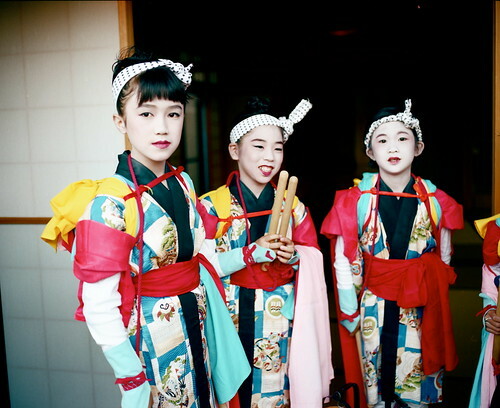 There are several festival-related events, but one of the major events is the parade of neighborhood yamaboko* — tall, gorgeously attired floats that are pulled through the city streets while young musicians play processional music that dates as far back as a thousand years or more. 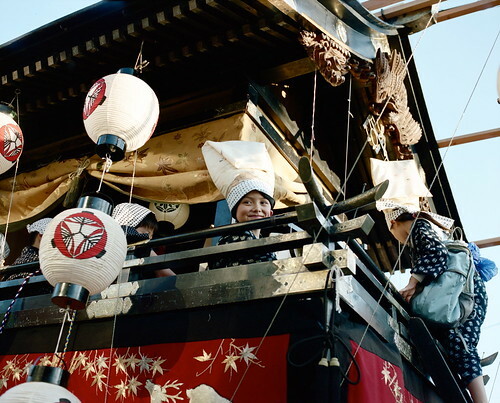 Sasayama’s parade of yamaboko floats is similar to the famous yamaboko junkō parade that is often considered the highlight of Kyoto’s month-long Gion Matsuri, though on a decidedly more intimate scale. 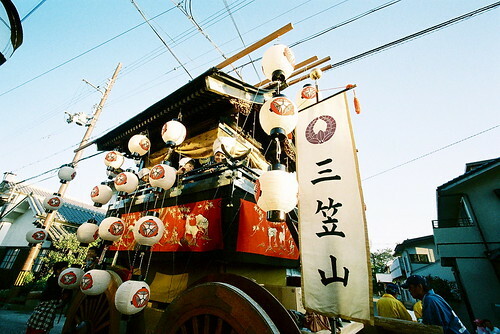 In Sasayama you can avoid the crowds that plague the Gion Matsuri events and instead enjoy the sound of parade chants, processional music, and massive wooden cart wheels on pavement in relaxing, close-quarter, high-fidelity stereo surround. It’s hard to convey what the yamaboko parade feels like through photos alone, so make sure to check out the video included below for a more sonically satisfying rendition. 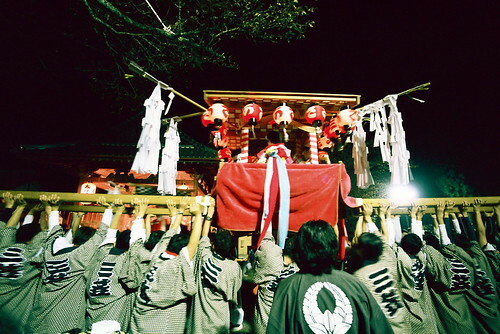 The other major event associated with the Sasayama Autumn Festival is the procession of the mikoshi, lantern-garlanded portable shrines, through the city streets. I’m not absolutely sure about how many mikoshi were involved, but at a minimum there were seven paraded through their respective neighborhoods in the late afternoon and early evening, eventually culminating in the assembly of all the mikoshi at Kasuga-jinja shrine after an hours-long march through the city streets. 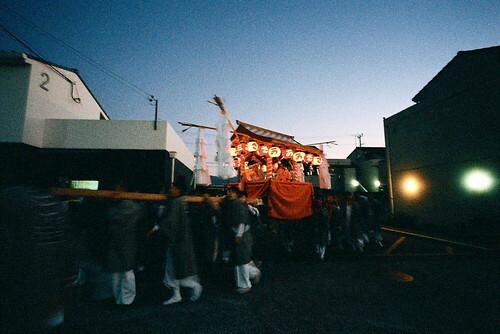 At dusk the mikoshi begin to make their trip to Kasuga-jinja, carried on the shoulders of some twenty or so young men who wear traditional matsuri uniforms that display the name of the neighborhood where the mikoshi is based. 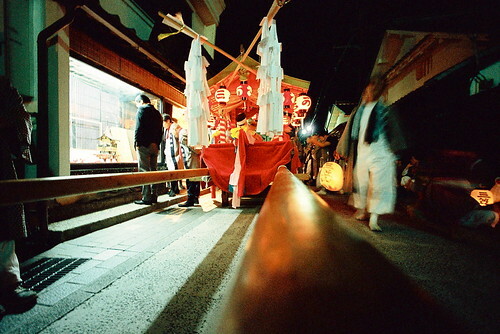 As dusk falls, the mikoshi make their way through the city streets, lanterns swaying with the shoulder-rhythms of the mikoshi bearers who are themselves pacing to the rhythms of the songs played by the young musicians riding inside. 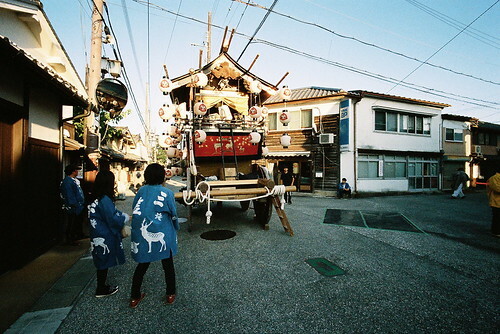 Because the mikoshi are heavy, there are frequent rest breaks on the way to the shrine. The mikoshi bearers stop to hydrate, have a smoke, and just generally give their shoulders a break. During one of these rest stops, I made sure to pop into a local sake shop and picked up a small bottle from a Sasayama brewery with an image on the label that I remember being related to Sasayama’s other famous festival, the Tamba Sasayama Dekansho Matsuri — a bon-style dance festival that’s especially associated with this tune. 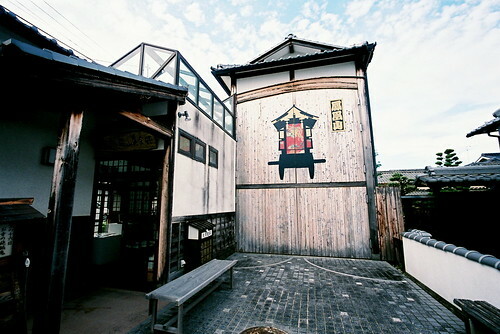 The fact that rice wine is an important local product is made evident by its prominent appearance as an offering in the many provisional altars on display throughout the area during this period that are dedicated to the festival gods, as well as individual floats and mikoshi. 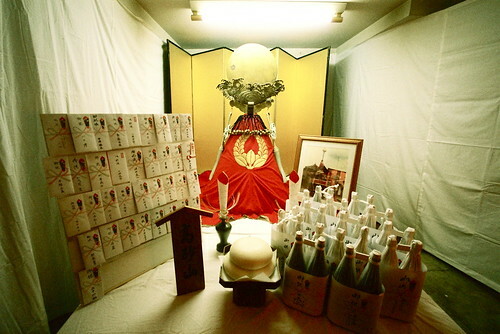 In the photo below you can see a sacred Shinto mirror, associated with the presence of divine spirit, as well as offerings of mochi rice cakes, sake (nihonshu — 日本酒 — in Japanese), and envelopes full of cash donations. The shrine itself is massed with spectators — easily five hundred people or more — who are there to see the procession of the mikoshi, which is a wildly energetic affair, to say the least. 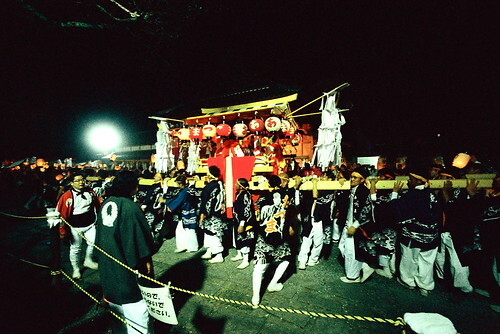 The mikoshi are paraded before the main stage of Kasuga-jinja where the local grandees have assembled with the kannushi, the shrine’s priests, at the forefront. The display of the mikoshi is also a display of the prowess of the mikoshi bearers and it’s not enough to simply walk the mikoshi by the front of the shrine stage; instead, the mikoshi are paraded around the shrine grounds at speed, almost like motorboats navigating the confines of a small body of water — the paths they take are fluid and always changing in relation to one another, and constant adjustments are improvised in relation to new and unexpected vectors of motion. 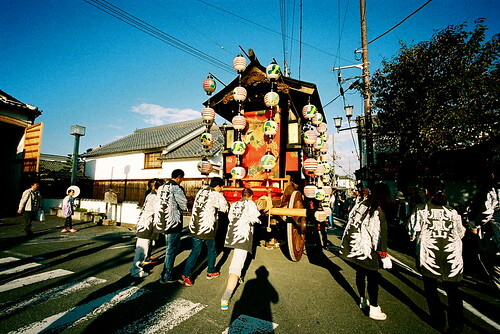 The mikoshi teams chant loudly, aggressively boisterous, and when they approach the stage they hoist the mikoshi high into the air, displaying not only the mikoshi itself but also the strength and endurance of the mikoshi team. The parading of the mikoshi is manically kinetic, a sense that’s not captured very well at all in the photographs that I managed to take while at the festival, though you can get some small sense of it if you watch the video below until the end. (You’ll also get a very nice sense of the long tradition of the kind of cheesy synth music that is a hallmark of regional promotion videos in Japan.) Imagine a circus in which the trained elephants parade around drunkenly, continually in danger of falling over into the surrounding crowds of spectators, and the display of the mikoshi might be something like that — only with music, loud chanting, lanterns, and the brightly-painted persimmon shrine acting as backdrop. Of course, no Japanese matsuri is complete without rows and rows of festival food stalls, and the Sasayama Autumn Festival is no exception. 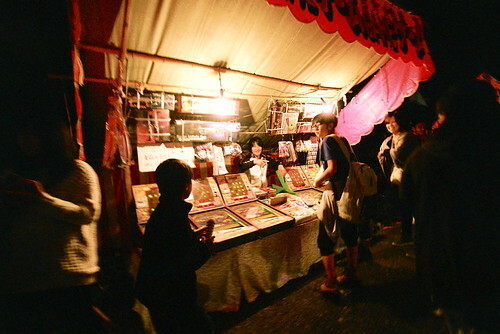 There are toys and games galore, as you can see in the photo below, but I myself am always most attracted to any type of fried mochi on a stick, or those delicious tamago senbei — fried eggs on shrimp crackers with an oil-slick of sauce poured over and just a smattering of mayonnaise to top it all off.